Are you struggling with the neighborhood in which you live? Are the ‘cons’ besting the ‘pros’ no matter how long you make that list? Are promises of ‘urban renewal’ by elected officials merely promises, or worse, unsophisticated attempts lacking vision and funding? Most importantly, are you unable or unwilling to move? Maybe you have more control over that neighborhood than you think. 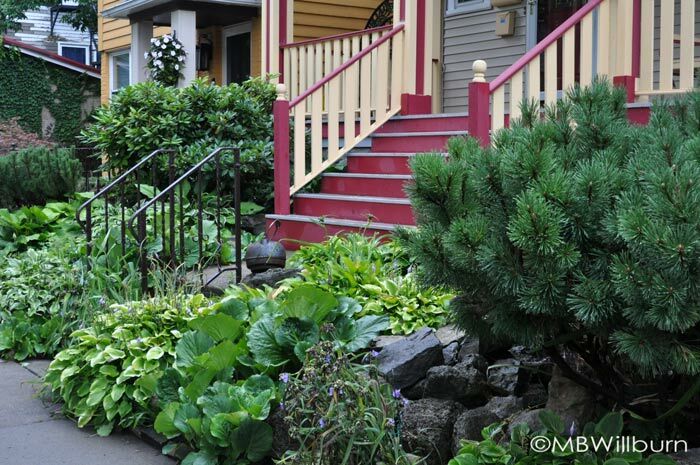 Maybe it’s time to pick up your trowel and start an urban renewal with your own front yard. While I do have a habit of linking the garden to pretty much every aspect of life (leading to the occasional eye-roll on the part of friends and family, and particularly my teenagers), my philosophy is simple: The outside world connects us to each other and to the Earth – exponentially enriching our lives. Creating a garden is a way of accessing that connection for oneself and one’s community, and doing so is worth the effort we expend upon it. This philosophy formed the basis of my recent book, Big Dreams, Small Garden, and I continue to speak and write on this topic whenever I have a chance. 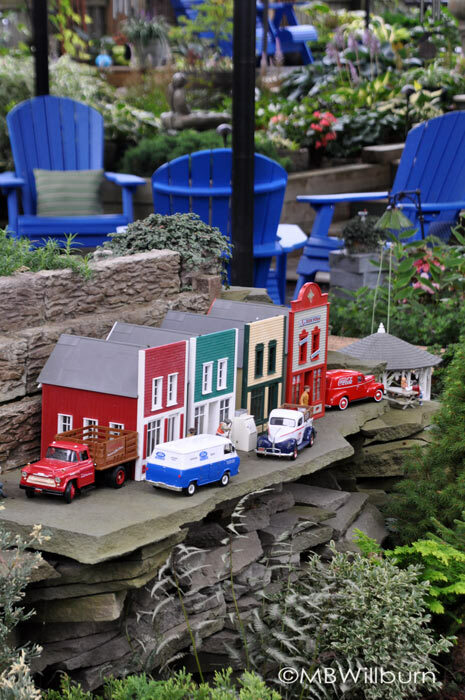 This week in Buffalo, NY, I saw this way of life illustrated by an awe-inspiring collection of gardens and gardeners. Working together and with the event Garden Walk Buffalo, each one has helped re-energize a struggling city and make it a tourism destination point. While only a two-day event in July, the result of 400+ city gardens prepared to meet well over 60,000 visitors every year is a city that lives and breathes green and beautiful spaces during the entire growing season. Hell strips have become Heaven strips. Entire city blocks have been transformed. Citizens take pride in their homes and the homes of their neighbors – often going above and beyond to take care of adjacent properties that need a bit of TLC. But it’s the backstory that makes this event so astonishing. Over two decades ago it started with just 29 gardeners touring each other’s gardens. That’s it. A garden tour between gardening neighbors in an economically depressed city whose heyday had come and gone. Each of these gardeners had chosen to pick up a trowel in the midst of urban decay and change their world. They ended up changing a city. Creating a garden is a way of accessing connection for oneself and one’s community, and doing so is worth the effort we expend upon it. Turns out he hasn’t been to Buffalo in a very long time. And during that time there are those who have been imagining…and implementing. 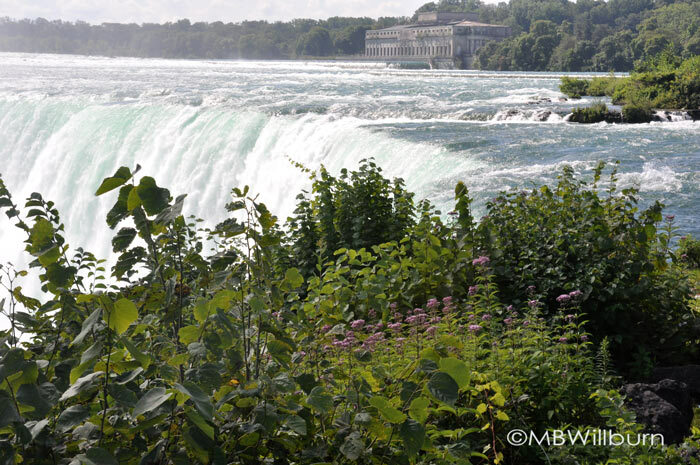 Buffalo is New York’s second largest city with just over 250,000 people (from a peak of 580,000 in 1950). 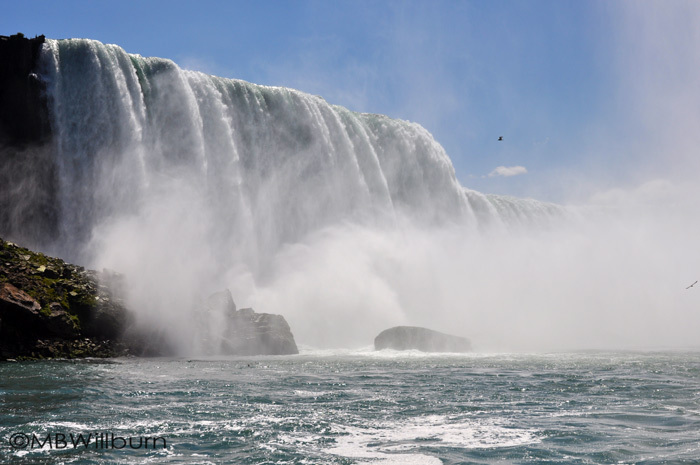 It sits on the eastern shore of Lake Erie, and provided the western terminus of the Erie Canal. The Canal, completed in 1825, became a crucial route for trade and manufacturing between The Great Lakes and New York City via the Hudson River. A changing demographic. A challenging landscape. My friend was on point when it came to the architecture of Buffalo. Outstanding examples of art deco and Victorian buildings do pepper the city, and the visitor is instantly aware of the part it must have played in commerce and industry during the 19th and 20th centuries. At 11.30 at night I gazed up at a steel skyscraper completely encased by terracotta blocks and marveled at the craftmanship of a bygone age. Plant-geek colleagues on an architectural hooky hour snuck into the offices the next day and reported that it was just as amazing on the inside. 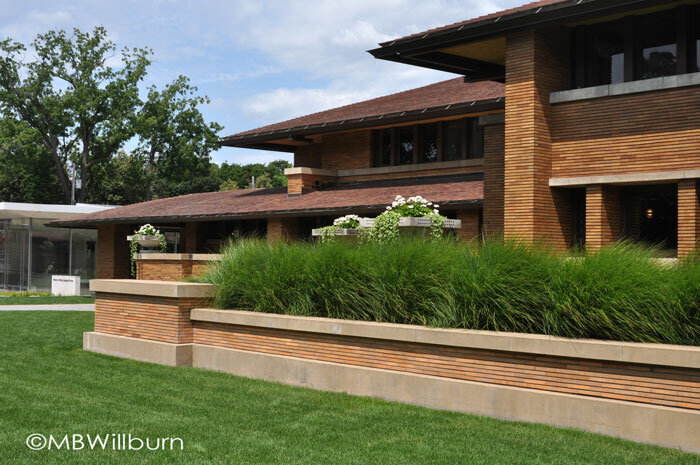 The newly restored Martin House Complex, designed by Frank Lloyd Wright and completed in 1907, can be found in the Frederick Olmsted-designed Parkside neighborhood of Buffalo. In 1962, it was in such a dilapidated state that the main house was turned into three apartments and the carriage house and pergola were demolished to build two apartment complexes. Yet over the last few decades as the city deteriorated and residents fled to the suburbs, many neighborhoods have battled with a drug culture, rising levels of crime, prostitution and an increasing amount of absentee landlords with little connection to their communities. At the last census in 2010, the median household income in Buffalo was just over $30,000 and and almost a third of residents lived at or below the poverty line. Though there are many fine examples of Victorian and Queen Anne homes, many houses are a patchwork of siding, additions, not-so-perfect paint jobs and small lots. In short, things are far from perfect. And that, my friends, is the point. There is no need for perfection here. 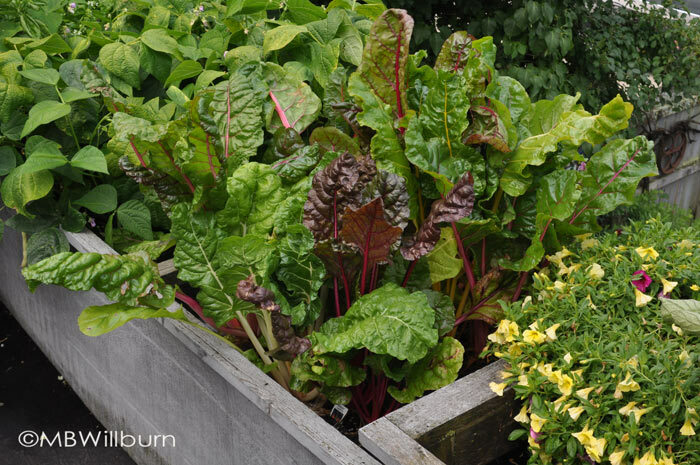 To walk through these neighborhoods – to go house to house studying the grassroots efforts of homeowners taking back their neighborhoods one garden at a time – is nothing less than inspiring. There are formal displays and over-the-top exhibitions of color and excitement. There are Japanese gardens, water features and plant collector showcases. Some gardens have a secret aspect to them, whilst others spill out onto the pavement and offer themselves to passers-by. 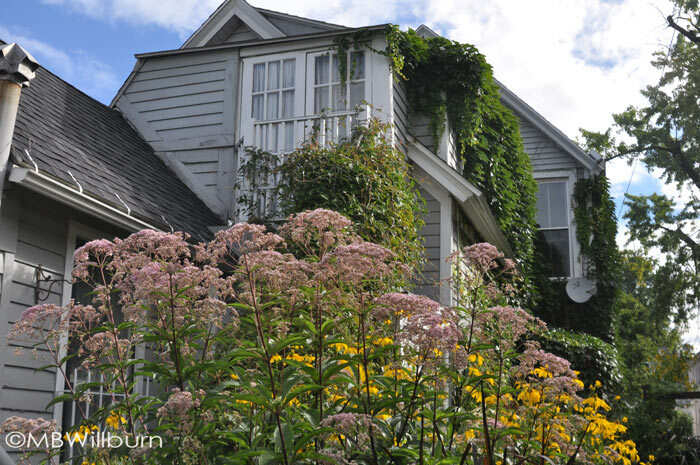 A beautiful balance between natural and man-made color greets visitors at a home on one of the many streets in Buffalo’s Cottage District. 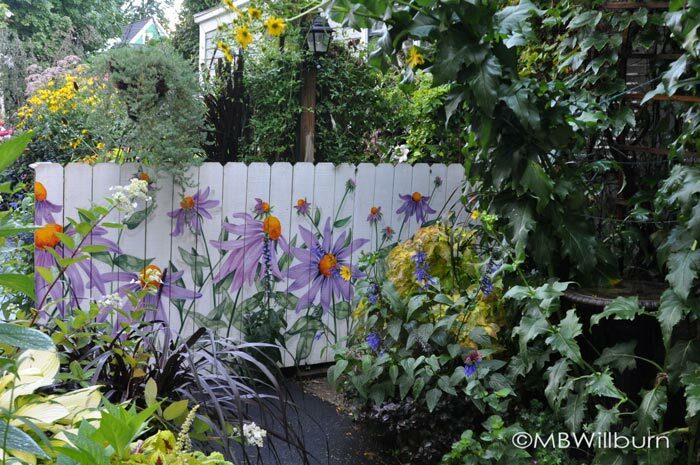 ‘Buffalo Style Garden’ – It’s a thing. 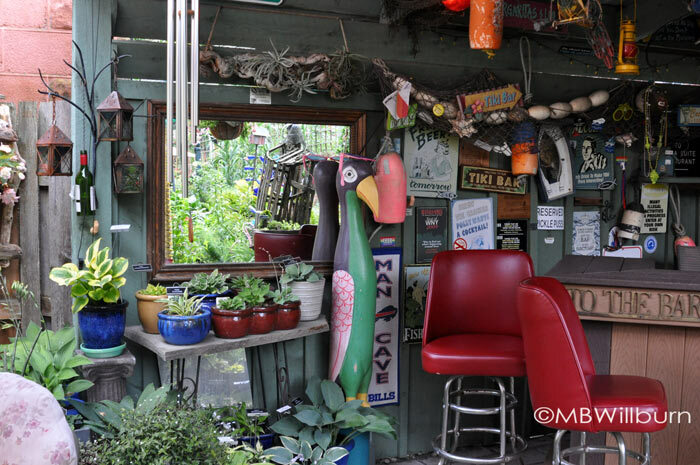 However, from whimsical Edens to outside Tiki bars, each garden has one thing in common: a uniquely personal feel that is not always present in garden-tour gardens. 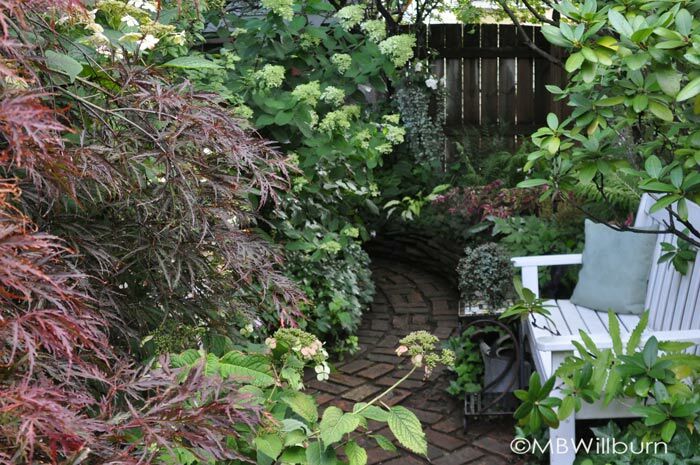 The term ‘Buffalo Style Garden’ is now regularly used to reflect this idiosyncratic approach to gardening – an ideal one for those who might not consider themselves gardeners at the outset but who have many other interests that can easily be incorporated in their outside spaces. 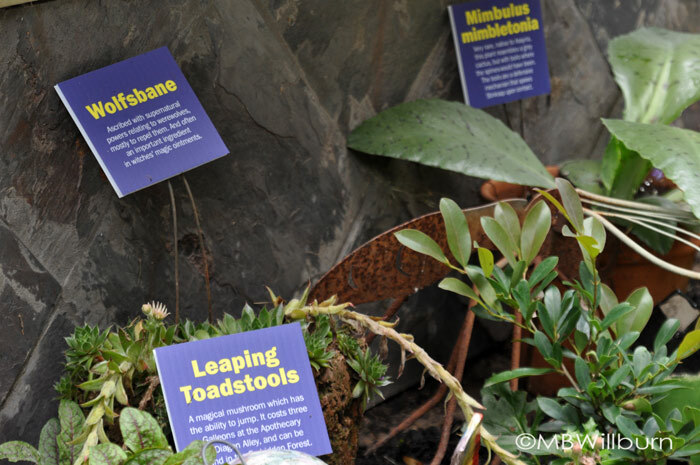 For instance, I saw a Harry Potter garden this week – each plant carefully labeled with the humor and wit of a die-hard fan. I will not forget it. 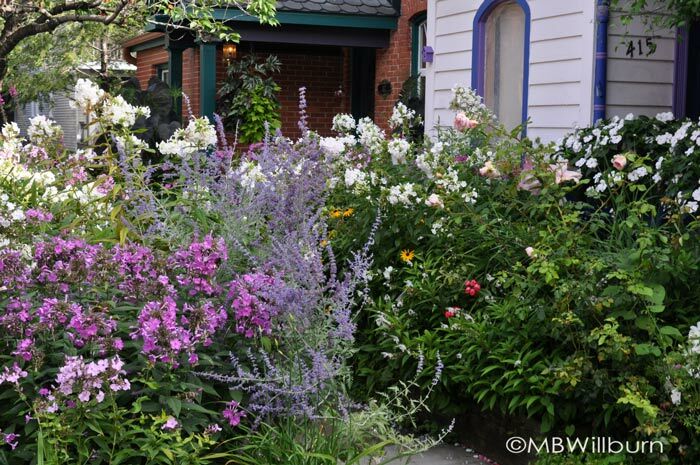 Now in its 23rd year, Garden Walk Buffalo operates through Gardens Buffalo Niagara – a nonprofit 503(c)(3) organization that supports local garden events, art sales and bus tours and is in turn supported by the generous gifts of sponsors and donors. GBN gardens are regularly featured in high-end gardening magazines. The organization gives out grants for community beautification projects such as hanging baskets or street median gardens. It makes an economic impact of 4.5 million dollars on a city learning how to renew itself in a new millennium. And let me tell you, it knocked the socks off of 354 garden writers from all over the nation this week (and we only saw a small percentage of the participating gardens). One other not-so-minor detail? 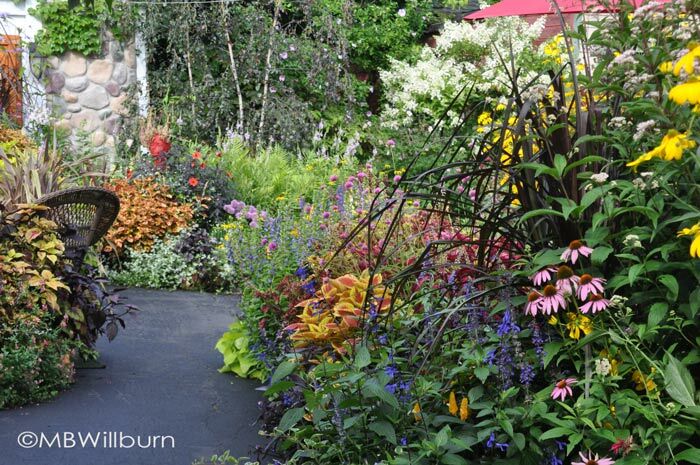 This 400+ garden tour is completely free. No tickets are required. Think your community is not up to the challenge? Convinced you don’t have the skill to create that kind of gorgeous? It’s important to understand that with few exceptions, these gardeners are not garden ‘designers,’ they are regular people with a passion for their town and a passion for gardening. They are gardening with what they have. They are building on each other’s knowledge base. They are enhancing their neighborhoods – not fundamentally changing them with a “magic pill” development. They have overcome the challenges of their properties and seek to help others do the same. It is my very great hope that those facing similar challenges in cities and communities across the nation will too. Great article about a city I’ve come to LOVE in my 3 visits over the last 10 years. Just keeps getting better and gardens are key. And I didn’t even mention all the containers, hanging baskets, incredible median strips etc… that are dotted all over the city. I look forward to going back. Even if you saw ALL the Garden Walk gardens, you would have seen only a small portion of the of the lovely homemade gardens in and around the city. People have been busy making beauty all over the area! To see the contagion of gardening filling the city….so touching and important for other gardeners to witness. You can make a difference. Buffalo proves that. Thanks for the comment! 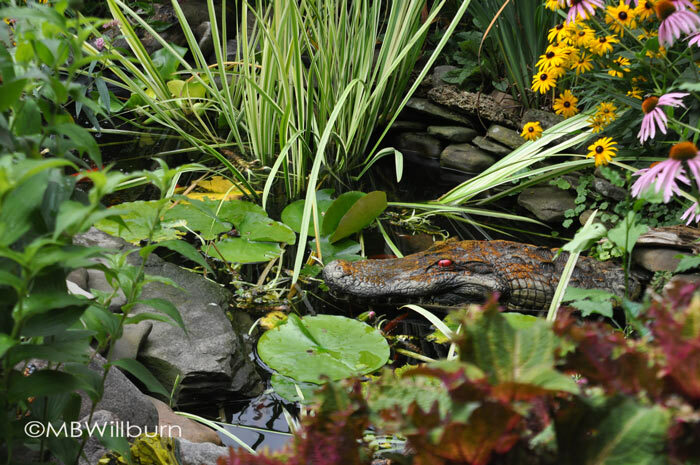 Thank you for the wonderful story , and thank you for visiting Buffalo and our gardens . Question is the anyway you can send us a copy of the paper so we van post it in our yard for next year garden walk . Thank you so much for the kind words about our gardens . Will do Joe! Your garden was the first that I toured and the style of your house and garden reminded me so much of our last house (on which I wrote my book, Big Dreams, Small Garden). I am only sad that I didn’t see your garden before I wrote the book – I would have loved to have profiled you both! Very much enjoyed your writing. Excellent recap and points of things I didn’t even see although I was right there with you! Thanks Jennifer. I know I missed a lot myself. That is the way with these things – can’t see it all, but I hope to go back next July. I doubt the median home price in the Garden Walk neighborhood is 69K. I live in the neighborhood. That is nowhere near correct. Apologies, my figures came directly from 2010 census data as linked, and I can certainly believe that they have changed in 7 years (boy I wish our city’s had – they remain at or below 2010 levels!). However, to prevent any confusion or misinformation, I’ve removed the reference. Thanks for your input. Thank you for this lovely article!! We have such beautiful gardens in this area I’m thrilled so many people were able to witness this beauty!! An added bonus is how wonderful the people are! So true Kathie – we were met everywhere with genuine smiles and friendliness. Such a pleasure! Although I’ve lived in CA since 1985, I still miss the “good neighbors” that make up Buffalo (if it weren’t for the Blizzard of ’77, I’d still be there!). I recall when people started creating gardens in their front yards; my friend Karima was one of the first when she lived on Brantford Place, and although she’s moved, I have no doubt that her garden is still one of those on the Tour. Thank you for a wonderful article showcasing a unique and wonderful city. Hi Marianne, I almost missed this article. Great summary of a wonderful event. I’ve been following the Buffalo event for years but haven’t made it there yet. Very worth going – such a wonderful surprise.